Rugs made from natural fibers like wool tend to be longer lasting and more durable than machine made rugs. Wool rug repair is done correctly by a few companies in the U.S. Only a handful know how to tediously repair damage and can provide wool rug restoration that is undetectable. Smart Choice is one of those repair experts! Choose the best when you need wool rug repair for authentic family heirlooms and beautiful new rugs alike! There are several types of wool rug restoration services, and each is specific to the type of damage that your wool rug has developed, so every rug gets unique care that is specific to its repair needs. For any repair, we have the tools to complete the process professionally. This includes industrial sized looms and rug stretching and blocking equipment that your rug may be placed on. The most common wool rug repairs include fringe repair, edge repair, and hole repair. Wool rug fringe repair is fairly easy and inexpensive if we only secure the fringes that have begun to loosen. Our weavers can simply re-tie them and secure the repaired fringes with a small, hidden stitch if we feel it is necessary. However, if we have to employ a Zangera stitch to implant new fringe, the skill required – and the cost – goes up. The techniques Smart Choice employs are flawless, so you won’t be able to tell the repaired area from the original! For this type of repair, a weaver ties off the ends of the rug where the fraying has begun, and he or she uses a technique called overcasting to bind up the edges of the rug. In this type of wool rug repair, the frayed edge is tidily wrapped with yarn to give the rug a tougher and cleaner looking edge. Once professional wool rug edge repair is complete, it should never have to be done again unless it receives some kind of severe damage. The new edge not only repairs abrasions, pet or insect damage, but it protects the rug’s edges from future wear and tear as well. Our wool rug hole repair service may be used in the case of pile unraveling, tears or moth damage. The cost of this type of rug repair, as well as the amount of time it will take to do the repair, is determined by the extent of the damage. Hole repair requires rug reweaving – a skill that is not easy nor cheap! 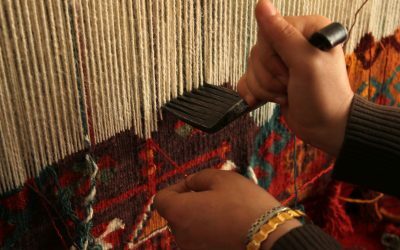 A skilled weaver must first rebuild the wafts and welts to reconstruct the rug structure, then the craftsperson expertly recreates the rug’s pattern with wool threads. In the final stage of rug hole repair, the new loops are trimmed to the length of the existing pile. Wool is a natural fiber that is strong and resilient, it can easily be spun and dyed virtually any color. The popularity of the wool rug is no doubt thanks to the availability of sheep and goat wool for thousands of years in all corners of the world. The first known wool rugs were woven around the Caspian Sea, mainly in Northern Iran. To this day, some of the most beautiful and highest priced wool rugs come from this area.